The 16th U.S. President and two of his best Civil War generals, Ulysses S. Grant and James A. Garfield (both from Ohio), speak about their recollections of the War Between the States. They explain their military pasts, how the war affected them, and reveal how they crossed paths. Their frustrations and accomplishments are discussed, as well as some humorous situations they encountered from 1861 to 1865. The Widow Lucretia Garfield shares stories of the 20th President’s assassination and death (including some very eerie predictions) and details about “The Funeral of the Century.” She also brings the audience up-to-date about her family since those tragic days. A discussion about Candice Millard’s 2011 book follows the presentation. Join the Lincolns for an engaging dialogue about their early lives, how they met, their courtship, marriage, and family – plus anecdotes about their boys and life in the Executive Mansion in Washington City. Law, politics, and Civil War are interwoven into their story, too! This is also a fine opportunity to ask your questions of the 16th U.S. President and his wife. Two former First Ladies try to find solace after experiencing unspeakable tragedies. Mary Todd Lincoln and Lucretia Garfield discuss the Victorians’ interest in séances, astrology, dreams, and premonitions – and share how these beliefs affected their families. They also reveal strange facts about their husbands’ deaths. James and Lucretia Garfield exchanged approximately 1,200 letters during their courtship and marriage in the mid-19th century. Many of the letters chronicle James Garfield’s service in the Civil War – 28 months that saw him rise from lieutenant-colonel to major general, from relative obscurity to national prominence. These letters contain candid commentary that spans history. They could have been written at any time in history: from Valley Forge, the Mekong Delta, or Mosul, Iraq. Listen, learn, and experience a view of the past as Ed and Debbie give a first-person reading of the timeless accounts of the Garfields’ wartime thoughts and home front activities – the details of their private lives, from the suffering and carnage brought on by war to the domesticity of their first “real” home and toddler’s first words. The terrible tragedy of President Garfield’s assassination in 1881 shattered Lucretia’s world. First Lady for only three months, she was suddenly thrust into the spotlight during his suffering after the shooting, staying constantly by his side. She was admired and respected by her fellow Americans and people abroad as she publicly exhibited strength and courage. However, her shy and private nature resumed after her husband’s death when she returned to Mentor, Ohio. § Life in Washington, D.C.
Two American women – from different generations – sharing their differences and commonalities. 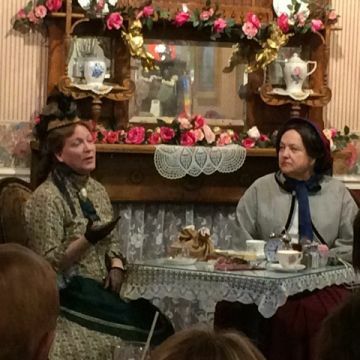 Mary Todd Lincoln (Marian King) and Lucretia Garfield (Debbie Weinkamer) meet over tea and discuss their paths to the Executive Mansion and beyond. You will be surprised about the experiences they had in common. Discover how they dealt with tragic losses ~ especially the assassination of their beloved husbands. Hear them expound on interesting topics such as children, politics, and spiritualism. Join us for a conversation that was never in your history books. It’s also a perfect way to celebrate Women’s History Month!